Does anyone remember a long, long time ago, when Howrse had a public forum known as the Classifieds? Where you could post a wanted piece and increase your chances of finding things sooner? Well, it left us when many players abused that power, and it was used to scam a lot of people. Regardless of this fact, back when we had the Ideas Forum, it seemed every day, we had people wanting the Classifieds back. I trust that you TBHers are honest players who just wanna let the world what you need, and are willing to do it the right way, so I present to you TBH's Classifieds! They're organized by server, category and are in alphabetical order. Most of the ads are linked- click them to go where you need to (it will open in a new window/tab). If the person places an ad and specifies that they do NOT want it linked, you'll simply have to PM them. If you'd like to place a wanted ad regarding something you're looking for it's completely free and I'll even give you a graphic if you want/need it! Click! NOTICE: if you are scammed in following one of these ads, please contact me immediately. The ad will be pulled, and proper measures will be taken to ensure that does not occur again. Looking for the traditional services/business classifieds? Click here! 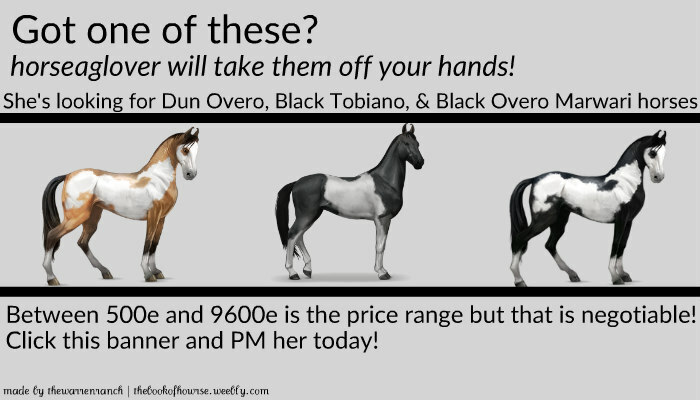 horseaglover is looking for a VIP member interested in making a Marwari, Arabian, or KWPN Breeding group- shoot her a PM!